Commodes, Handicap Toilet, Toilet Seat Chair, Uplift Commode Assist, CA200. 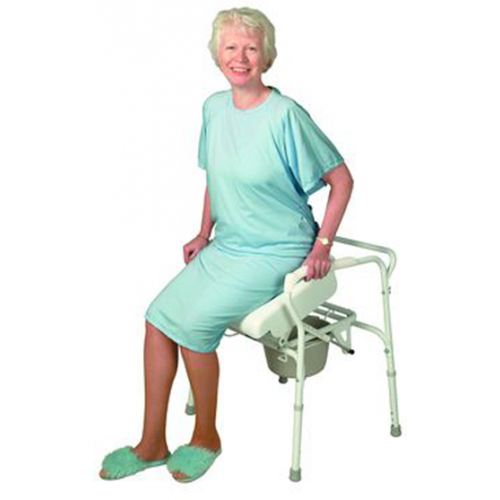 Uplift Commode Assist is a lifting, self-powered commode chair that delivers up to 70% lift assistance! The Commode Assist supports those up to 300lbs/136kgs. 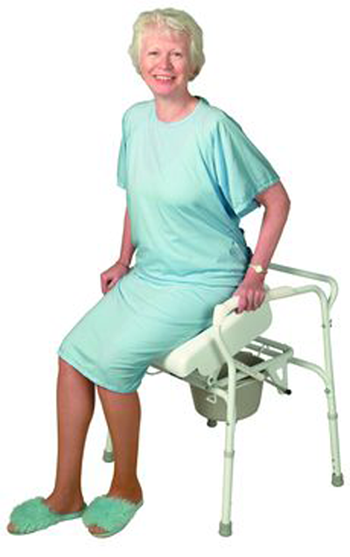 The Commode Assist allows patients to stand by themselves after using the commode or toilet. A great product to relieve stress and strain on the joints. A great benefit for those who have lost significant lower or upper body strength. The Uplift Commode Assist is also a great benefit to those who have lost mobility as a result of Muscular dystrophy, Lou Gehrig's desease (ALS), Arthritis, Parkinson's desease, Degenerative joint disease, or Post-operative conditions. The Commode Assist gives patients the help where independence and privacy are most needed. The Commode Assist also can be used as a standalone, or placed over the toilet. Slowly lifts up to 300lbs/136kg with 70% lift assistance. Self-powered lifting seat releases slowly as you stand. Cushioning pads increase your comfort as the seat lowers. Non-skid rubber feet for patient safety. Release lever and auto-lock keep seat in place until you're ready to get up. Removable back rest allows for easier placement over the toilet. Fits over most standard toilets. Removable snap-on seat is easy to clean. Includes cover and splash guard, and bucket that slides out. Extendable legs with five different height settings. Steel frame coated in white powder protects against moisture. Coveted "Ease-of-Use" Commendation by the Arthritis Foundation. Weight Capacity: Up to 300 lbs/136 kg. 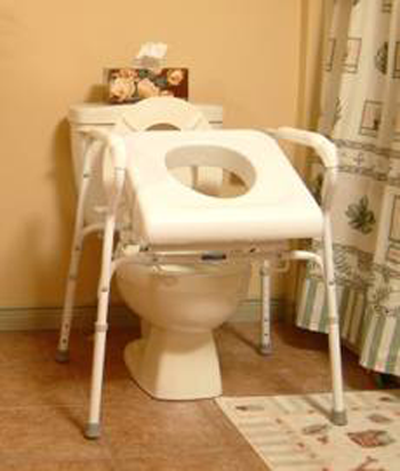 Commode Use Instructions details the proper use and maintenance of bedside commodes. 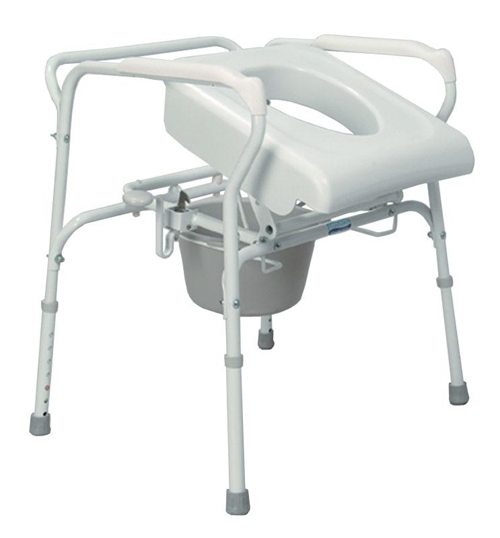 Bedside Commode Use Instructions offers use and maintenance information. Raised Toilet Seat Instructions provides information for safe use and care. IS THIS COMMODE THE SAME SIZE AS A REGULAR COMMODE AND COULD I TELL ME THE WIDTH AND MAX HIEGHT. First of all I ordered the product and paid $39.95 for express shipping and when it did not come in the two days like it was supposed to I called and found out they never even shipped it until four days after I placed the order. I told them I wanted my money back for the shipping. That took some phone calls to get the money back and then they were only giving me back $33.25 so I called again and they told me they kept part of it for the regular shipping so I had to remind them that the offer was free shipping with a fifty dollar order. OH the person on the phone said. I did get my money back. The product did not work for us because it was too big for the area. I called to return it and they would not take it back because it was a toliet item. We had not even used it I told them, but she said it says right on the site it is not returnable. I guess I must have missed that, I didn't read every single word on the page. They should tell you on the phone when you order it that it cannot be returned. I will never order from them again and I do not recommend them to anyone. I cannot give the chair a rating because we never got to use it.